Looking for a unique and stylish pair of cowboy boots? Don't worry, PFI Western Store, home of BootDaddy has a vast selection of Men's, Women's, and Kids Corral boots. 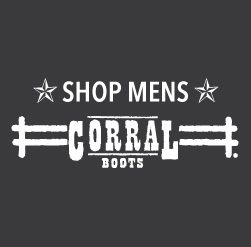 Corrals fashionable designs are handmade from the finest materials, including some exotic leathers. Their gorgeous western boot designs are fun and unique.